Foreign Minister Avigdor Lieberman said in a Thursday meeting with Russian Prime Minister Vladimir Putin in Moscow that Russia's elections were free and democratic, Israel Radio reported. He based his assessment on determinations by Israeli observers participating in the election monitoring, he said. 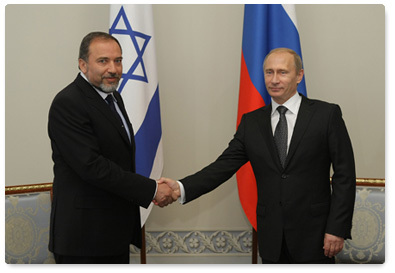 Lieberman's position is opposed to the views of Secretary of State Hillary Clinton, the White House and former Russian leaders, which expressed concern over irregularities in the recent parliamentary election. The campaign for Sunday's election was marked by "limited political competition and a lack of fairness," observers from the Organization for Security and Cooperation in Europe and the Council of Europe's parliamentary assembly said. The vote count "was characterized by frequent procedural violations and instances of apparent manipulation, including several serious indications of ballot box stuffing," the monitors said in their preliminary report. Probably only Belarus who would agree with Israel that the elections were OK - everyone else can see the Russians are still up to their old games. How about we make a deal with Russia and swap their democracy for ours...they can have Key and we'll take Putin.